No one likes to sleep on the floor. It’s just a simple fact. Getting a good night’s sleep is essential in our everyday lives and it is no different when you are “roughing it” out in the outdoors. Being out in the wilderness is inherently active so in order to make the most out of your experience, it is essential you find a way to get some rest to be able to recharge for the next day and continue enjoying. There are a variety of different options available to help make quality sleep a possibility, such as sleeping pads and foam mats. These are good but unless you shell out a lot of money they really don’t provide much in terms of comfort and take some time to adjust to. Another option is to get yourself the best camping cot so you can bring an elevated and comfortable bed with you where ever you go. There are a lot of different ones out there, so take a look at a few we’ve found to help you determine which is the best option. 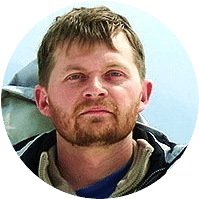 Purchasing something to help you get more restful sleep while out in the wilderness is an important task that should not be taken lightly. Not all options are created equal and there are a few important factors to consider before making a decision. Here are the ones we’ve identified as being most important. The size of your portable mattress is incredibly important in many different ways. First, you want to take a look at the length of the bed when it is unfolded to make sure that you will fit on it. There’s nothing worse than getting into your bed to get some shut-eye and having to leave your feet dangling off the end. You’ll also want to take a look at the width. Some products out there conform to traditional bed sizes—king, queen, twin, etc.—but many do not. If you’re someone who rolls around a lot or likes to spread out while sleeping it might be good to look for something that is wide enough to give you that option. The last thing you will want to look at in terms of size is how big it is folded up. 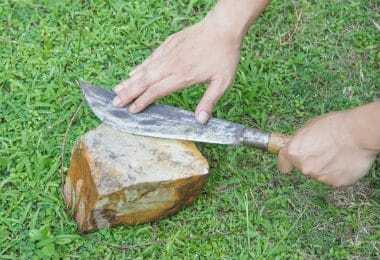 Almost everything out there will fold up, but some fold up smaller than others and this could be key depending on your intentions—if you think you want to carry it on your back or if you are just going to throw it into the car. Think about what you think you will need and then look at the available choices to determine the superior option. These products can vary greatly in how much they weigh depending on how big they are and what materials are used. Think very carefully how you are planning on using this product and then decide how heavy you would like it to be. If it is going to go in your basement and only be transported to your favorite camping destinations by car than perhaps this will not be too much of a concern, but if you plan to carry it make sure to visualize what it will be like to add this weight to your load and how much you can tolerate. 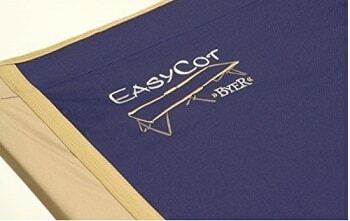 Like anything, your cot is only going to be as strong as its weakest material. The last thing you want is to be sleeping deeply and then be woken up rudely by a crumbling bed frame as you roll from one side to the other. Typically these types of beds will be made using steel, aluminum or wood. Let’s examine the advantages and disadvantages of each one. Wood: very few products nowadays will be made of wood. Its only real advantage is aesthetic. It is more susceptible to water damage and to physical damage from being dropped, banged, etc. and is often quite heavy. Steel: far and away the most durable frame material available, steel will be the material used in the most heavy duty beds. It allows for a larger load capacity, but its durability can come with a cost in that it will tend to make the bed as a whole weigh more. 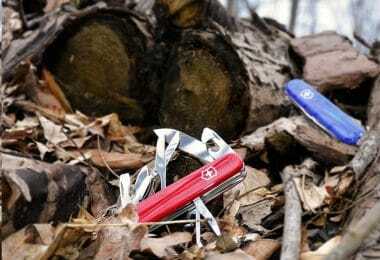 Aluminum: A good lightweight option that will also save you some money as compared to steel. It will not be able to hold as much weight as steel, but most aluminum-framed beds can hold respectable weights and are much easier to carry around. One of the key effects of the materials used for the frame of the bed is how much weight it will be able to support. This is a pretty straightforward factor to consider, but think about who might be using this bed and what kind of capabilities you want. Going for something with a lower weight limit will surely save you some money, but could be disastrous if someone unexpected uses it or if something as simple as your kid jumping up into bed with you happens. Think about your needs and try to find that balance between durability and budget. Polyester: This material is strong and flexible, which means it will be able to support heavy loads without breaking. It is also very light; on the bed it will seldom be much thicker than a piece of paper, which makes this type of bed lighter in general and therefore easier to transport. However, being firmer and thinner, these “mattresses” are not typically the most comfortable. It’s much better than sleeping on the hard ground, but it is very far from what would be considered a typical bed. Airbed: These inflatable mattresses are nice because they do a good job combining comfort and portability. Since they can deflate and be folded up to a fraction of the size they can be brought anywhere and an airbed will give you much more cushioning than something like a polyester bed. That being said, they can be quite heavy, meaning they might not be the best option for long hikes or situations where the bed needs to be carried long ways to where it will be set up. Also, for some people, airbeds are extremely comfortable, while others cannot sleep on them. If you’ve never slept on one think about giving it a try before purchasing something that includes an airbed. Foam: these mattresses will probably come the closest in recreating your bed at home. 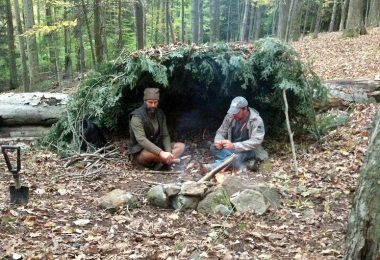 They won’t be quite the same and over a period of time you will notice the difference, but for a few nights, this could be the perfect way to combine the comforts of home with the beauty of the outdoors. However, it is important to note that foam mattresses will be heavier than most other beds and because they are thicker and have a permanent shape, their ability to fold up and be transported may be limited. The idea behind buying something like this is that it is portable and can be brought anywhere. For this reason, it is important to look at what is involved in the assembly of your portable bed. For some it will be as easy as unfolding but others may require you to put pieces together or perhaps more. Think about how much you are willing to do every time you want to use the cot when looking at the different options available. Some available options will give you nothing more than the bare bones: a mattress that folds. However, others will go a step further to help make them be a bit more portable or to help enhance their comfort. Some examples include pillows, side tables, pockets and carrying cases. Almost all available products will come with at least one of these extra features so think about which ones might be nice to have while you are out in the wilderness and then try to find something that matches these desires. As mentioned earlier, there are a ton of different options available to you in terms of portable beds, so to help you make the decision a little easier we have come up with a list of important things to look for as well as a list of some of the different products out there so you can compare them and find the one that will most satisfy your needs. 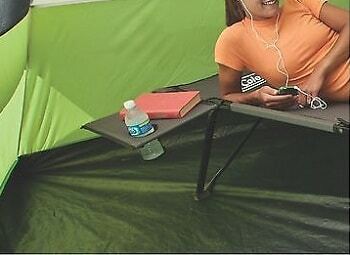 Extra features: Self-inflating and deflating airbed with 2 foldable side tables for drinks, lanterns, etc. 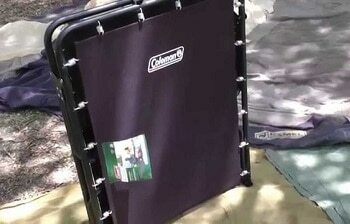 Description: Coleman Queen Airbed Cot with Side Tables and 4D Battery Pump is like the Cadillac of portable beds. First off, it’s huge. With a queen sized mattress, this bed could fit one person extremely comfortably or two people without really much sacrifice. The airbed will also bring an extra level of comfort that other options will not have and it is relatively easy to assemble. It comes with a 4D battery pump that both inflates and deflates the mattress automatically. The obvious downsides of this particular option are price and weight. At 40 lbs it is HEAVY and is certainly not something you are going to be carrying with you on a hiking trip. 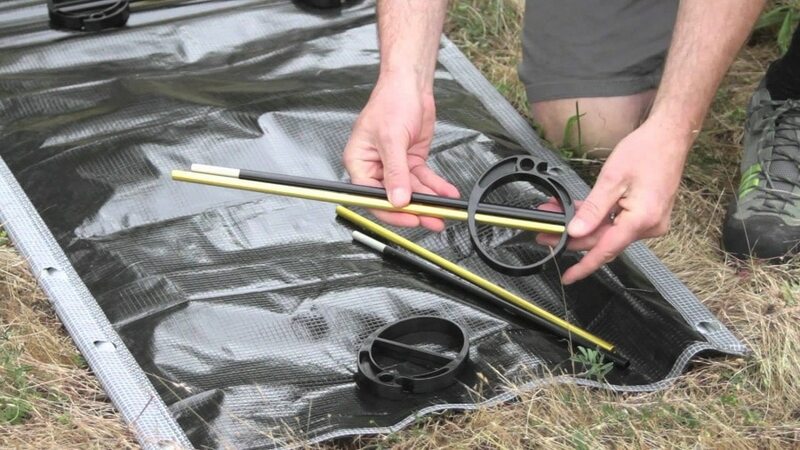 It is much better suited to those who will be arriving to their campsite with their car or truck and immediately setting up camp. The tables are also a nice option, which will make this setup feel not all that different than what you might have at home. Extra features: Side table and carrying case. Description: Coleman 2000007753 Pack Away Cotton – Twin is a very standard and practical portable bed for sleeping one person. One nice feature is that it is designed to be extra long and is able to fit someone who is as tall as 6’ 8”. If you happen to be tall or if you are someone who just likes to have some extra room this option gives you what you are looking for. It is also quite light, only 7lbs, and folds up nicely into a small carrying bag that could be slung over your shoulder and carried short distances. However, with its simple polyester sleeping surface, it probably won’t be the most comfortable option out there. Again, as mentioned above it will be much better than the floor, but that is about it. Also, at around $45, the price is quite reasonable. If you are a smaller person, though, it might be worth looking into even smaller options that could give you the same level of comfort for cheaper. Extra features: Side pockets, pillow carrying pocket, carrying case. 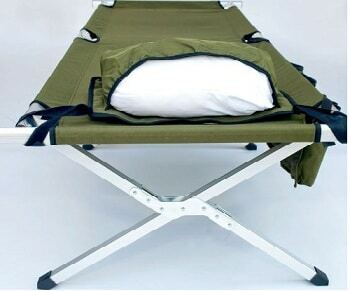 Description: Earth Products Jamboree Military Style Folding Cot is the “heavy-duty” version of your standard camping cot. It is modeled after what is used in the military and its durability and extra features make that quite clear. 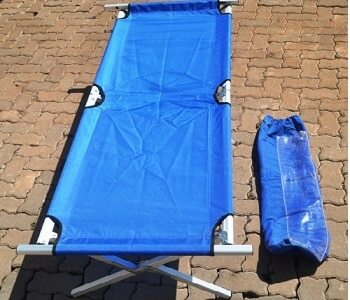 There are several side pockets that can be draped off the side of the bed to store flashlights, books, food, etc. There is also another side pocket of the top part where a pillow can easily be stored. Additionally, it too can be folded down into a smaller carrying case, but lugging it around might be a little more difficult as it weighs 13lbs. The frame makes use of both steel and aluminum to make it as strong as possible without adding too much weight. It is big enough to fit a 6’5” person and holds up to 350lbs. However, considering the price tag, the argument could be made that this is excessive and perhaps this particular option is not the most practical. If you’re someone who likes military-style equipment it is something to consider, otherwise, there are similar options that cost a lot less money and do the same thing. Description: The main advantage of Coleman ComfortSmart(TM) Deluxe Cot is that it is the closest thing you can find out there to the bed you might have at home. The spring coil suspension acts like a traditional box spring and the foam mattress resembles your bed at home. This isn’t to say it is exactly the same, but as close as you will get. The steel frame gives it a weight limit of 300 lbs and at 80” long it is sure to fit almost everyone. The foam mattress and spring coils do make it heavier, 20lbs, and harder to fold up so this isn’t the best option in terms of portability, but in terms of comfort, it is noticeably superior. Additionally, at under $60 it is reasonably priced compared to other products on the market. It does not, however, offer anything in terms of special features. 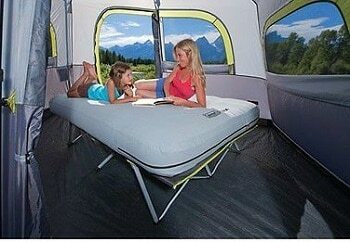 Description: The glaring advantage of Coleman Trailhead II Cot is its price. At $36 it is the cheapest option being discussed here and its low price does not mean you will be sacrificing quality. It is still made with a steel frame and with a polyester bed, which means it will be just as durable as most other similar products. However, the Coleman Trailhead fails miserably next to its competitors in terms of weight. At 20 lbs it is basically impossible to think of it being portable and as something that could be brought a significant distance away from the car or the house. It is plenty big and folds up nicely into a carrying case, but the case becomes somewhat obsolete when you consider how much it weighs. This is a great budget option, but for a little extra money you could get a lot more versatility out of your choice. 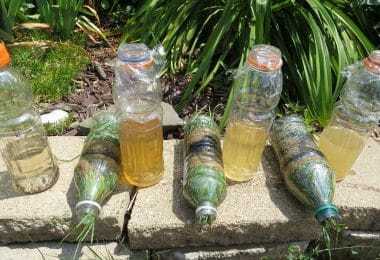 Description: Realistically there are few upsides of this particular product when compared to the others on the list. The welded steel frame gives it a bit of an edge in terms of sturdiness and durability, but not so much to justify the higher price. Additionally, Easy Cot Portable Folding Cot by Byer of Maine doesn’t feature a carrying case in the traditional sense, such as a bag, but rather more of a sleeve that fits over the folded bed. This really limits its mobility and this along with its 20 lb weight mean that it will be hard to move it further than short distances. In short, stronger frame materials give a marginal increase in strength and durability but not significant enough to justify its higher price tag especially considering its weight and lack of special features. 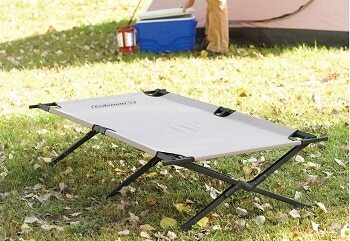 Description: Trademark Innovations Aluminum Portable Folding Camping Bed & Cot is a really nice all around option in terms of price, size and materials. It uses aluminum, which helps it in terms of weight but does mean a sacrifice in how much weight it can withstand. Its weight limit is 260 lbs, which is quite good considering most aluminum-framed beds do not support over 200 lbs. It also features a carrying case and is big enough to fit someone up to 6’ 3”. All of these positives are accompanied by a price tag under $40 and the opportunity to customize it a little by choosing between six different colors. If you think you need something that can support more weight take a look at the steel-framed options on this list, otherwise this particular bed could be a great choice for the average camper. Based on this list there are some clear winners and losers. If comfort is your top priority and you don’t care about weight and portability, there’s a clear choice for you, but if you’re more concerned about lighter, more mobile options, make sure to pay attention as several options are offered at much higher prices than their competitors without really offering a comparable improvement in the quality or design of the product. The trick is to know what you want and then to find out how much getting that will cost you. 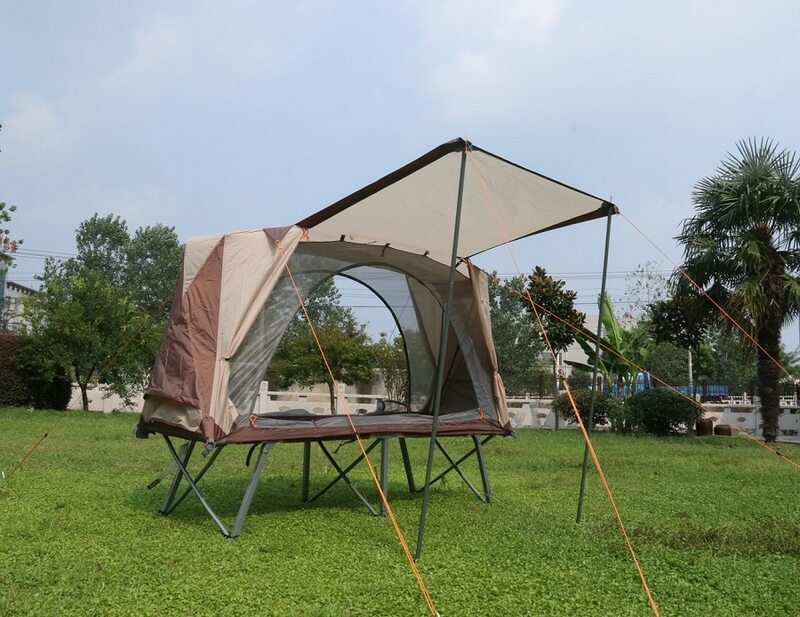 Following this path will surely lead you to find the best camping cot for you and your needs. As always, we want to hear from you. 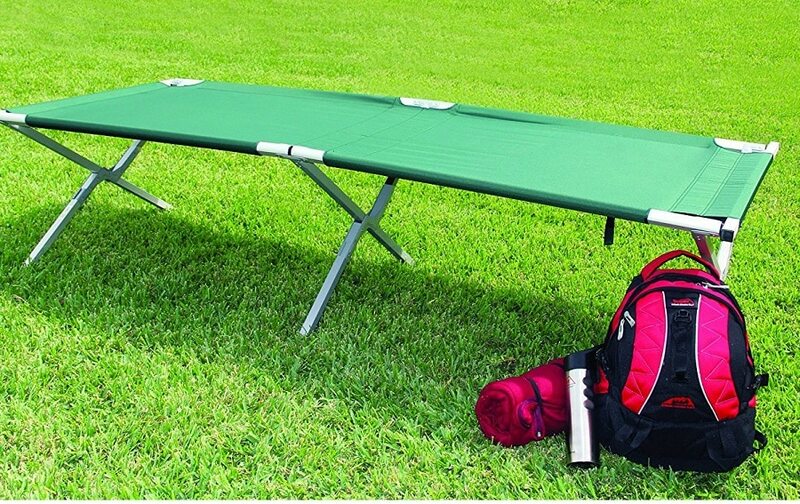 If you’ve used one of these beds or have another strategy for getting a good night’s sleep while out camping, let us know so we can include it in future articles. Now that you have a better idea of what to look for and some of the options available, we hope you’ll be able to find your perfect bed. Happy sleeping!